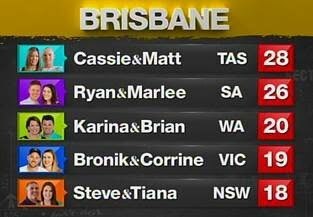 Last night we saw the teams who had tackled a tricky 70s split level home and wild weather in Queensland earn the first perfect scores of the season. The teams struggled to transform Ben and Danielle’s house of horrors with the House Rules and the elements putting them to the test. The newlyweds left behind some interesting instructions such as “style our house preppy eclectic” and “retain a hint of ski chalet in the living room” which led to some confusion amongst the teams. WA’s Karina and Brian finished third on 20 points. The married pair were scored down by both the judges and homeowners for the size of the kitchen with Wendy saying they should have fought harder for more space. “It was simply too small to be the true heart of the home,” she said. While Danielle loved the art studio they’d designed for her, it was criticised for its lack of functionality. “There is no desk, sink, no working space,” Joe said. Victoria’s Bronik and Corrine struggled and it showed in their zone. Their guest bedroom, laundry and entry underwhelmed with Wendy stating: “There were too many directions and that made the rooms feel a bit confused.” While the homeowners liked the rooms, Ben said “the finishes probably let you down.” They finished fourth on 19 points. Urban designer Danielle, 31, admitted she’s not one to cry but the makeover brought her to tears. “I’m so eternally grateful for what you’ve done and don’t think that any of your efforts have gone unnoticed”. Tonight the teams are off to Tasmania to transform Cassie and Matt’s original 60s house in Hobart. In the battle for big points, some will play dirty. And for others, it’s all-out war!